In this fifth edition of the bestselling text in organizational theory and behavior, Bolman and Deal’s update includes coverage of pressing issues such as globalization, changing workforce, multi-cultural and virtual workforces and communication, and sustainability. A full instructor support package is available including an instructor’s guide, summary tip sheets for each chapter, hot links to videos & extra resources, mini-assessments for each of the frames, and podcast Q&As with Bolman & Deal. Lee G. Bolman holds the Marion Bloch/Missouri Chair in Leadership at the Bloch School of Business and Public Administration at the University of Missouri-Kansas City. He consults worldwide to corporations, public agencies, universities, and schools. In addition to his many books with Terry Deal, he is also coauthor of Reframing Academic Leadership with Joan V. Gallos. Terrence E. Deal left active university life as the Irving R. Melbo Clinical Professor of the University of Southern California's Rossier School of Education. He is the coauthor of twenty-three books, including the bestselling Corporate Cultures (with A. A. Kennedy, 1982) and Managing the Hidden Organization (with W. A. Jenkins, 1994). 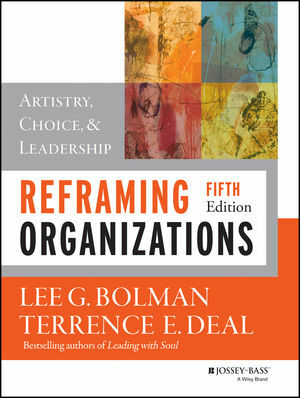 Bolman and Deal are also coauthors of Leading with Soul (now in its third edition), Wizard and Warrior, and their forthcoming book, Reframing Leadership (also from Wiley).